Porcini are considered by some to be one of the most delicious mushrooms, so it's no surprise its scientific name means "Superior Mushroom." Porcini mushrooms are filled with an abundant array of minerals, such as Iron, Niacin, Riboflavin, Copper, and contains almost no oil. 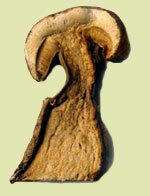 Because it is rich in minerals, as well as protein, the porcini mushroom is very often called “the meat from the woods.” It is important to mention that scientists consider this mushroom to have anti-carcinogenic properties. Regarding the nutritive value of proteins based on the FAO Amino Acid score for Quality of Protein (Egg = 100) the Porcini has a score of 37. *Foods that are an “excellent source” of a particular nutrient provide 20% or more of the Recommended Daily Value. *Foods that are a “Good source” of a particular nutrient provide between 10 and 20% of the Recommended Daily Value.